BEFORE! 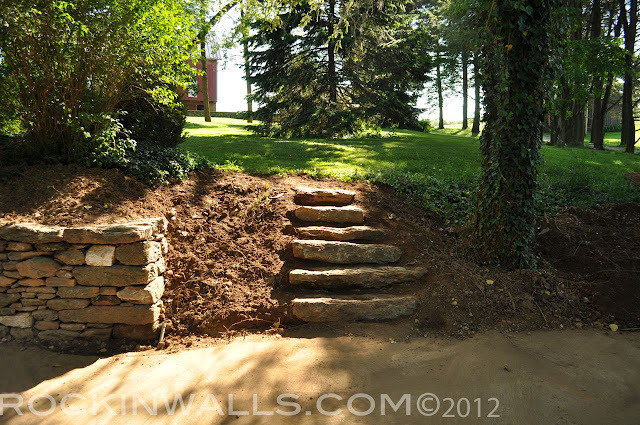 Mortared stone retaining wall - 19' length, 4' high left, 3' high right with steps. Reason for replacement - Hydraulic pressure (water) pushed wall over. Built in 1969. 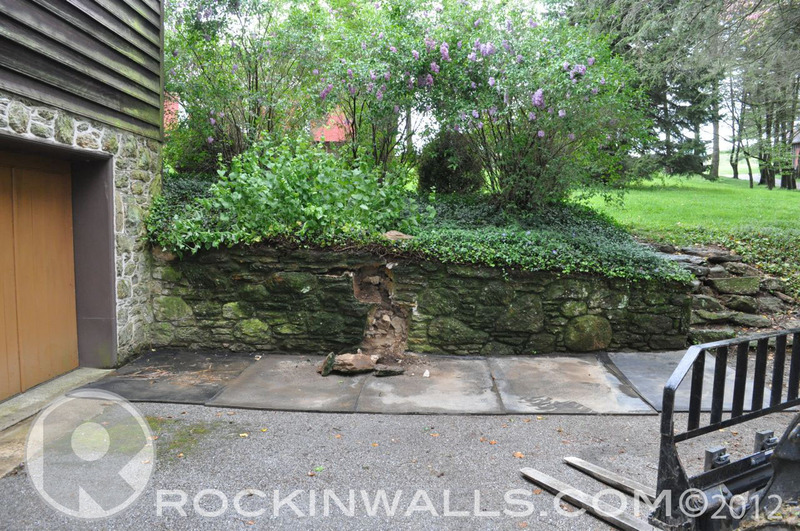 The wall would be rebuilt the same but with out mortar - dry laid. Built with a 1:6 or for every 6" up you come in 1" on the wall. Built to last 100 years +. 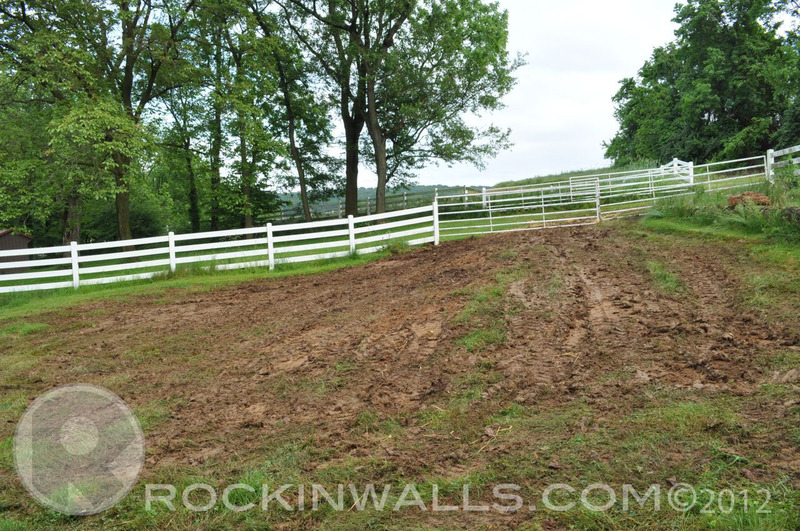 The most important part of the build was the wall had to fit the landscape and the time frame as to when the home was built. Other wise your only doing a injustice to the job and client. No amount of money can be spent for award winning stone masonry if it doesn't match the space! First day to the job site for set up. 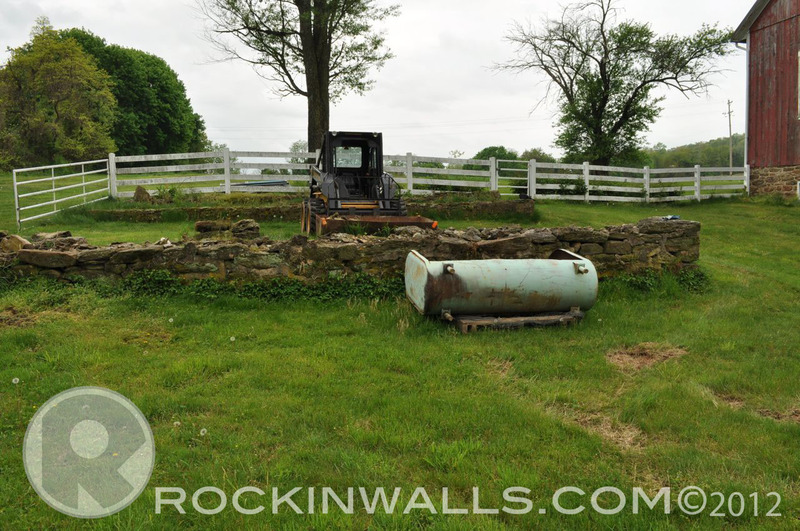 Bring my skid loader, rubber mats, 3 oil tanks for moving packing stone around and pallets. Next trip bring small trailer with all job site tools and porta -potty down into the spacing using the skid loader since dump truck would not fit down the little driveway. Set rubber stall mats up in front of wall to protect driveway when demoing the wall. 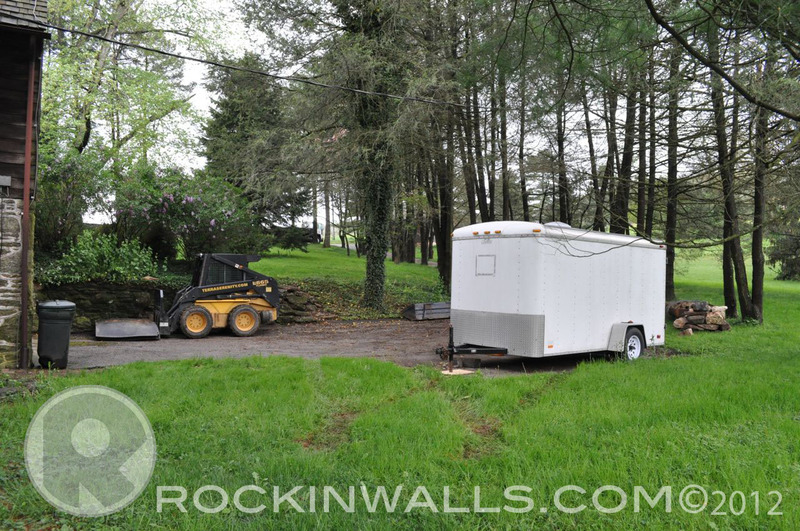 Start of the demo of the wall. You just never know what you'll find. Just some cinder blocks. 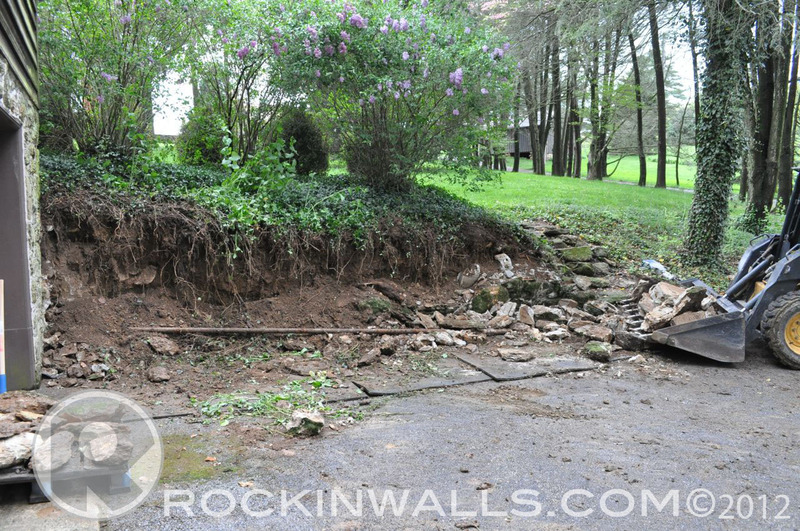 I really thought the wall would come down much quicker. But they built it so well it took a good day and a half to strip it out and remove most of it on site. Such a waste of good stone. I placed the stones that I could pack on a pallet. 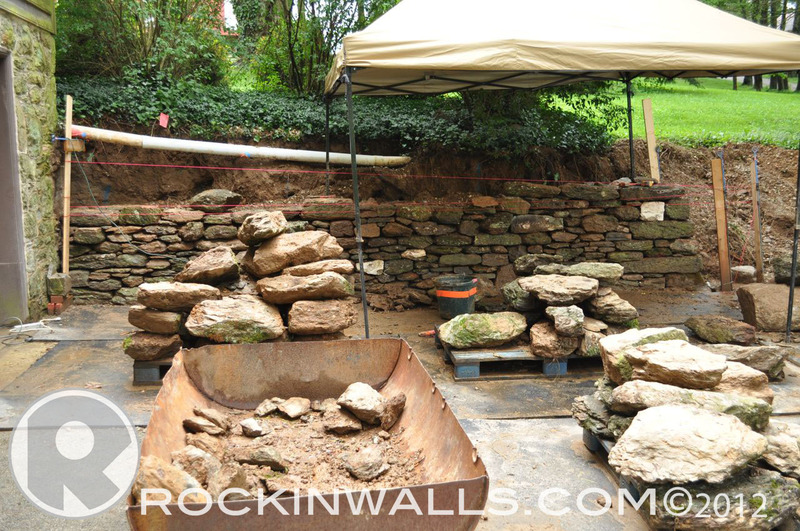 But 90% of the wall was not worth the time to make into smaller pieces with all the choices of stone on the property. Time is every thing. I gathered what I could but hauled most up to the stone dump site. As I stripped out for my foundation I found this lovely terra-cotta drain pipe installed behind the wall for wall drainage. Clearly it didn't work since the wall was pushed over with water. It might have been better had they included weep holes throw out the wall. Fondation stone shown above. Notice still have the rubber mats to protect the driveway. Caps on all my rebar stakes for safety. Only takes one fall and you might really wish you had taking the same safety pro-cautions. Safety first. Blog: Foundation Digging - great tool for helping set those foundation stones. 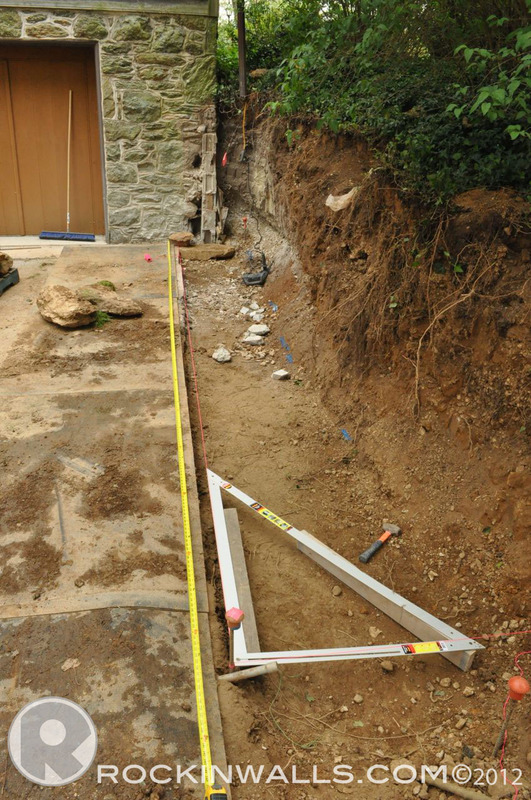 Blog: How-To-Foundation - build a foundation. 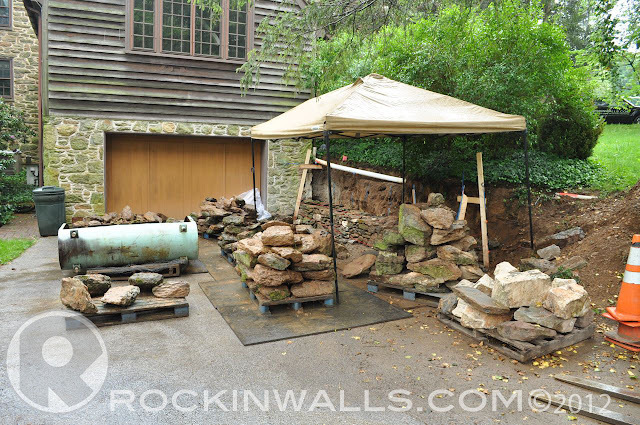 I had been scouting for stone all over the property but I was originally only thinking I would use the corn crib foundation to pick out most of the packing stones I needed. In these photos you see my 2 oil tanks being used to gather the small stones - packing for the inside of the wall. The more I spent time looking at this old corn crib foundation. I noticed I had the best stone looking right back at me. As I thought about it - it only made sense to reuse stone that others had already picked to be good choices for a wall. This meaning some one found the best faces on stones to be used for building. This really made a difference in the building of the wall. With out this choice the wall would not have come out as finished as it did. Blog: How To - Wall Stone Ingredients - details and images about packing stones along with other stones used to build a wall. Wall frames all set up with my first string line on the frames. Ready to build! 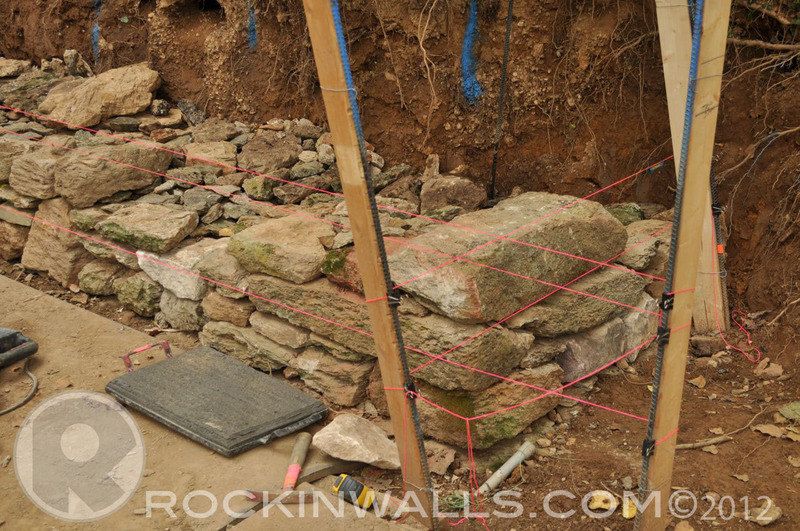 Now it was time to head back over to the corn crib foundation to gather up more stone. My 2 employes enjoyed sitting around and watch after all the heavy lifting they had done. (mini X and skid L) Thats ok I like to get dirty from time to time and use my hands. 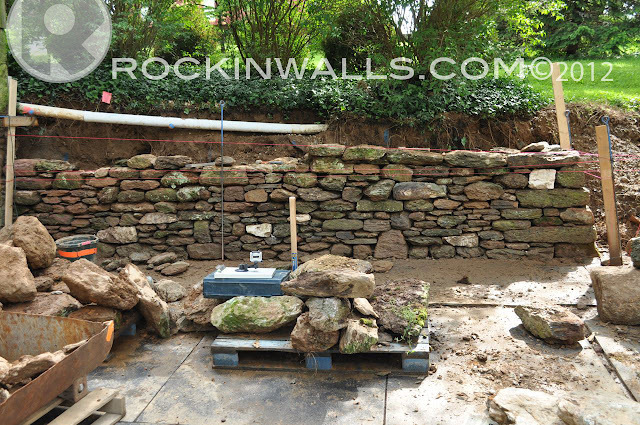 Some wallers love to feel each and every stone. I like to feel each and every one throw a good pair of gloves. Blog: Tool - Gloves what's your flavor? Start of the build. Took me some time to get back into the grove using this stone. Most of my walling is with Butler stone. Butler stones are shaped more like squares. I have only built a few things on my own farm with these type of stone. It took me some time to get going. Once I was able to spend the time to get to know each and everyone. They all began to fall into place one by one. In the corn crib I found some of the nicest wall head stones. I put these a side to use as my 90 degree corner stones. Locking them in like a dove tail design in wood working. I almost felt like I was working around lasers with so many strings set up. But for me double lines let me look down the line to see the edge of the wall. This helps to keep my stones in the correct place. They also act as a guild for building a level wall. I also used a knee board at the lower levels and for my foundation course. 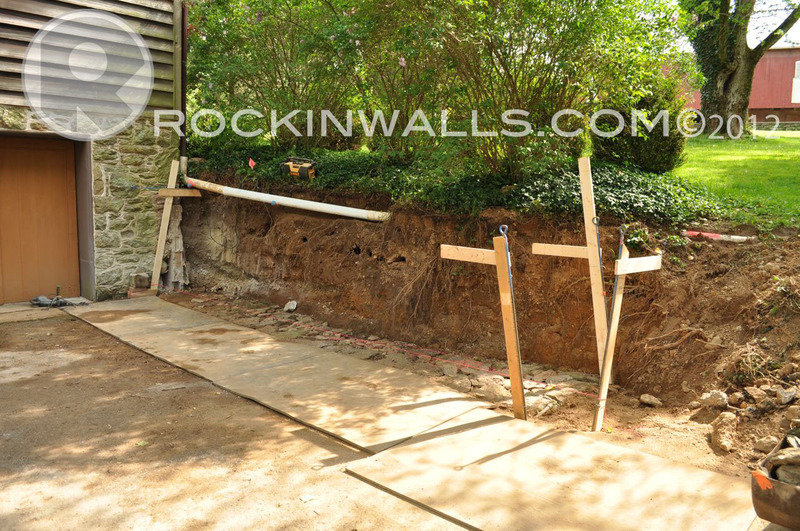 My walling frames are 1"x4" wood with rebar keeping them in the correct place. I set a level on the top of each one of the boards that protrude of the top to make sure I'm in the right place. In this picture you will also see to the left of the knee board. A Bosch hammer drill - which I used a great deal with a chisel bit to help shape my stones. If I had a high spot it was quicker for me to pull this out to shape the stone then a hammer or chisel. This stone is very soft making it incredibly easy to work with. Corner of the wall with front face stones and back wall stones. In the middle you'll see all the packing stones. 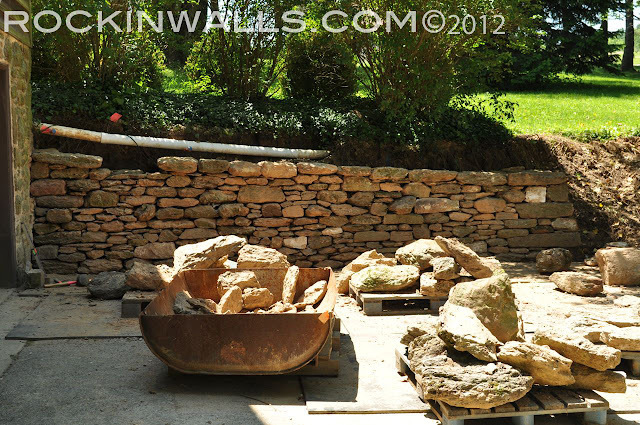 This is the job sit with all the stone I gathered from the corn crib and placed on pallets to move around. 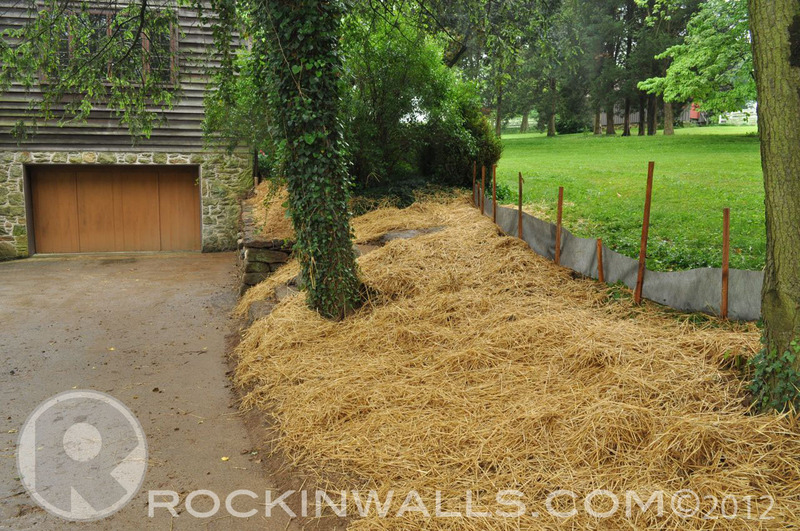 Rubber mats down to protect the driveway. Tent set up to protect me from the rain and other elements. The blue paint marks on the bank indicate where I should be planning on placing my tie stones. 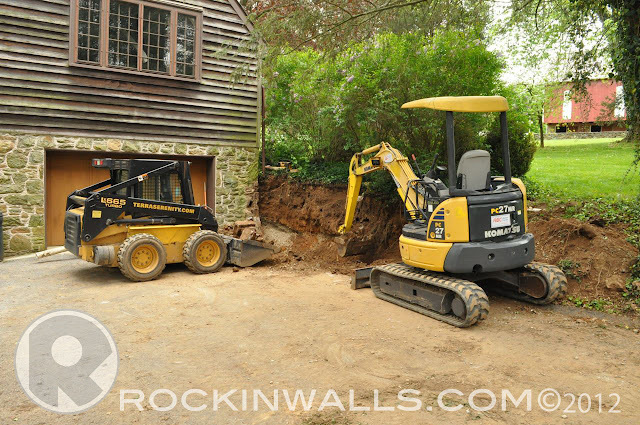 You will also notice I was working on building from the wall corner back to the garage (right to left). 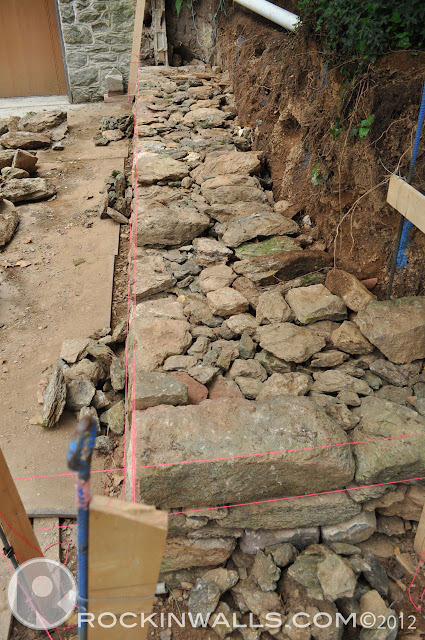 The corner stones would be the stones which helped to set the pace for other stones to follow - size and height. I was really able to find some key stones from the old foundation wall end to help make this corner one which was tying back into each side. 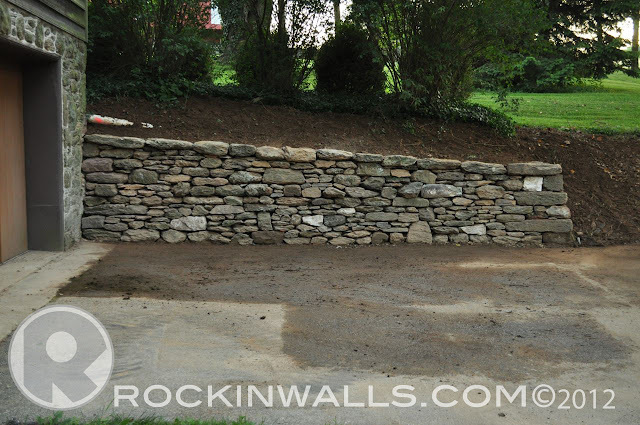 Protruding tie stones on this wall placed 22" up and set level on 3' centers. Notice the blue painted marks - then below you will see each tie stone. 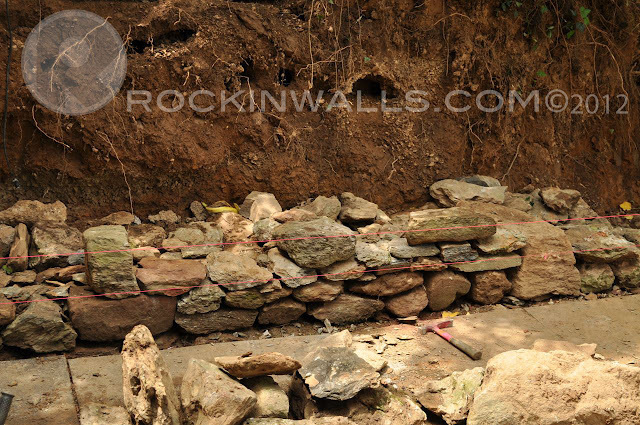 The ties stones help to tie the front wall to the back wall. 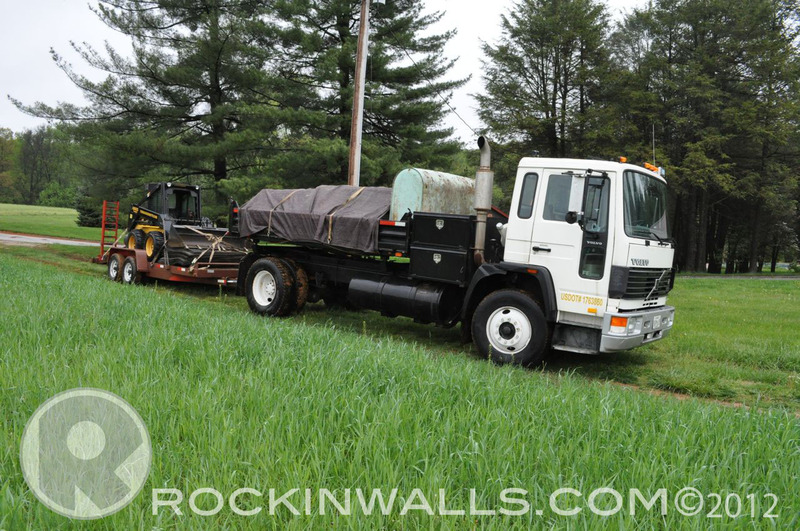 In addition they also help reduce the long term settling of the wall. Think of it as a second foundation level. Job site with all my palleted stone, rubber mats and oil tanks. This picture shows the top string line for caps. Three cap stones set at left end of wall over hanging wall by 2" to give a little contrast (shadow). More cap stones. Caps are really one of the hardest thing since you have to work backwards. You have to find the right stone for the top then make sure it hits the string line. 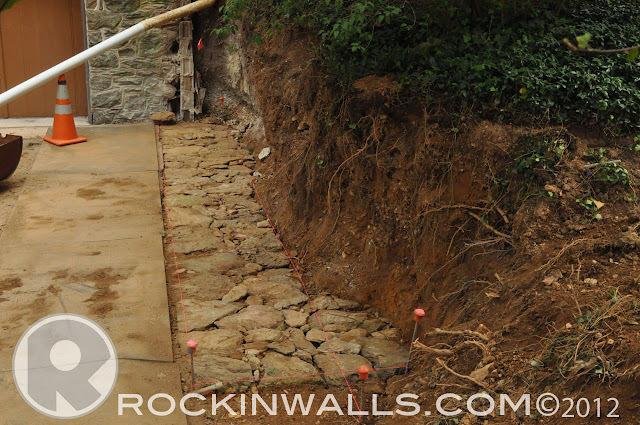 In order to do so you have to build from the cap down and find the stones that best fit the space in between. The last two walls have come very easy to me. Having small thin plates to help make adjustments really make each stone fall into place. Working throw my stones I gathered can be easy and some times can be hard. I was sure to use as much as I could to free up pallets before I headed back to the corn crib foundation to gather more. 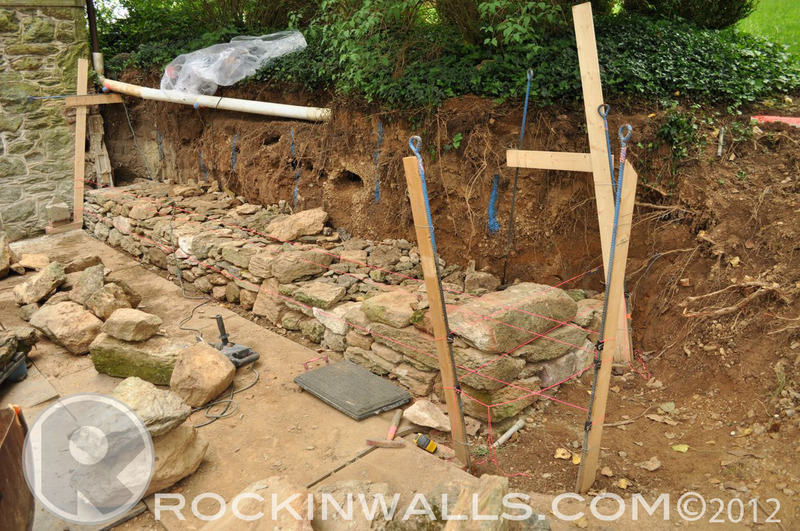 What I was finding was as I worked down on the corn crib foundation I was finding bigger stones. 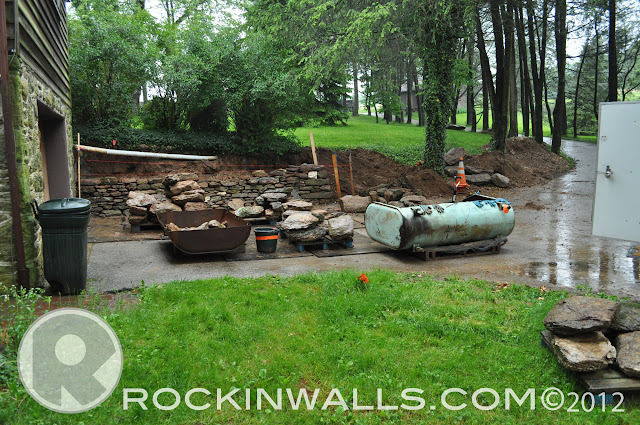 This was a bit of a issue since I was now completing the top of the retaining wall I needed smaller stones not larger ones. 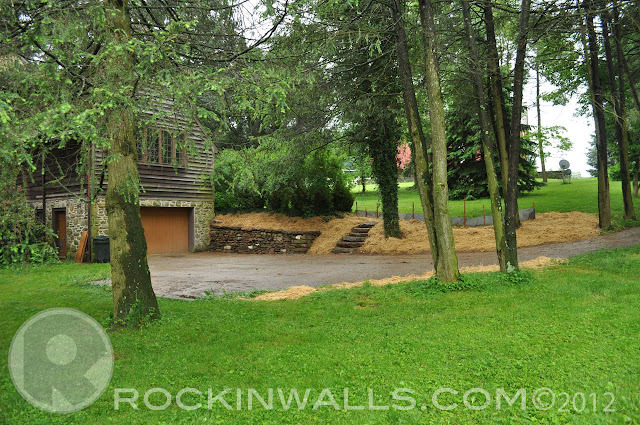 You can see in the photo all the large stones off pallets. I believe they were having a rock party when I wasn't looking. In this photo I had just placed a cap stone on the garage side (left end of wall) in order to create my last hole in the middle. I some times feel lucky this was one of those days. I guess after finding a new home for these forgotten stones. They treated me well. When it came time to fill the hole I had no problem spotting just the right stone. It was like I heard it saying pick me! pick me! All I could think was man "I feel lucky." With this wall I started at the lower left at garage. Out of the gate I was headed with 4 large stones at the bottom of course. I looked at my choices and realized I was headed for a road block if I didn't switch up my game. With such a mixed bag of tricks. I didn't have perfect grocery list of stones - but I soon realized I did once I stopped thinking about it. The biggest issue I had was getting my mind in the game. 95% of the walls I build use Butler stone which I like to refer to as a gauged stone. For example different size books. 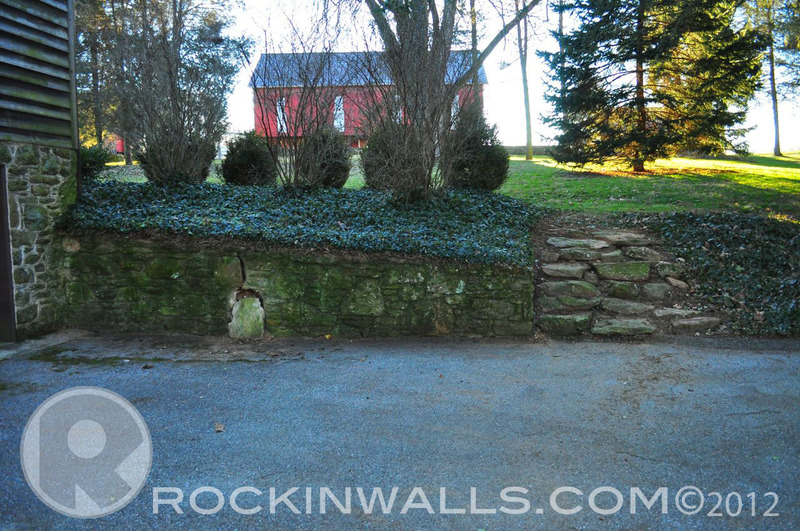 What I was dealing with was field stone but I had to be sure the stones I choose had a good faces on them for the out side of the wall BUT still ran length into the wall. 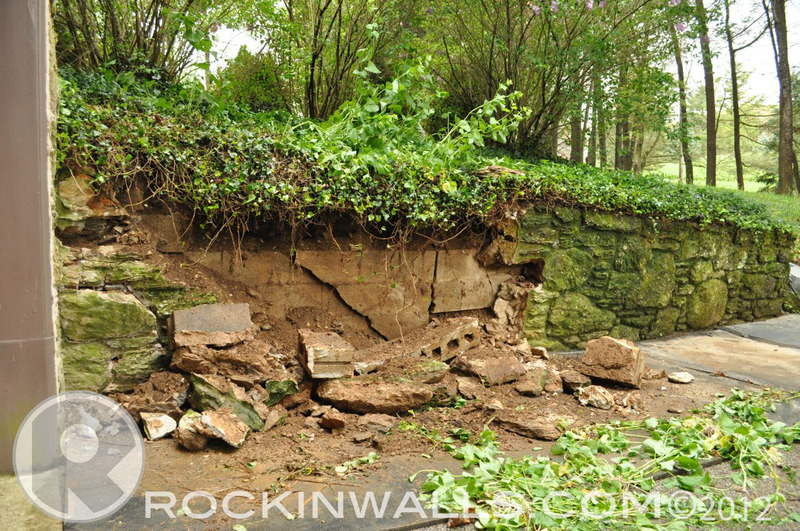 Other wise this wall would not be structurally sound or last up to 100 years. 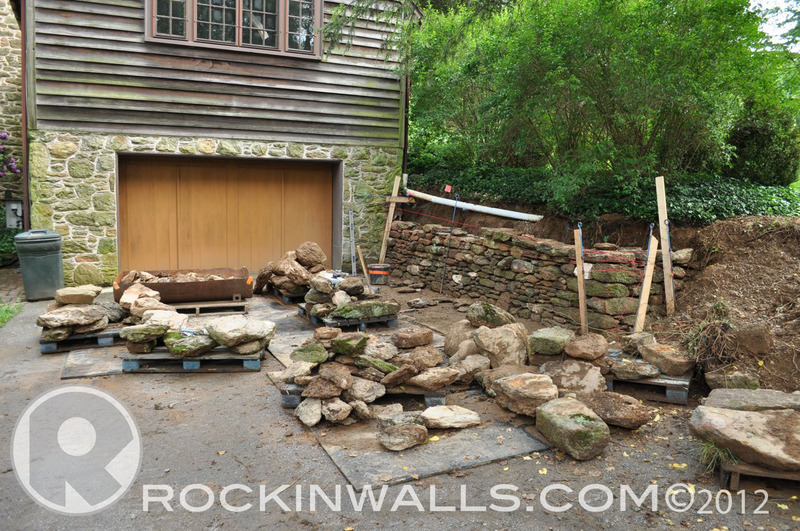 Some of the other goals when building this wall was to be sure to place larger stones in different sections to keep strong focal points mixed with different colors - notice a few of the white stones (blog) placed into the wall. I have to say the corner makes the hole wall for me. 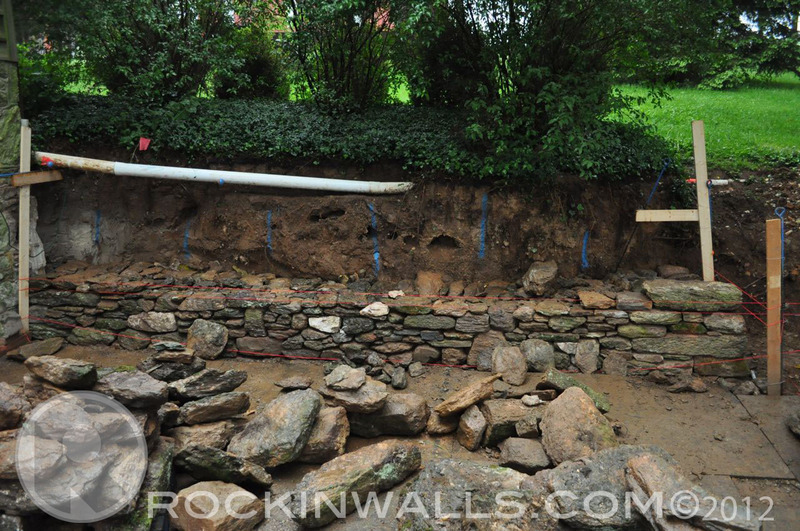 The home owner had steps at the end of the old wall. I suggested waiting to see what stone we had at the end of the build. To see if I had what I would needed to make a new set of steps. 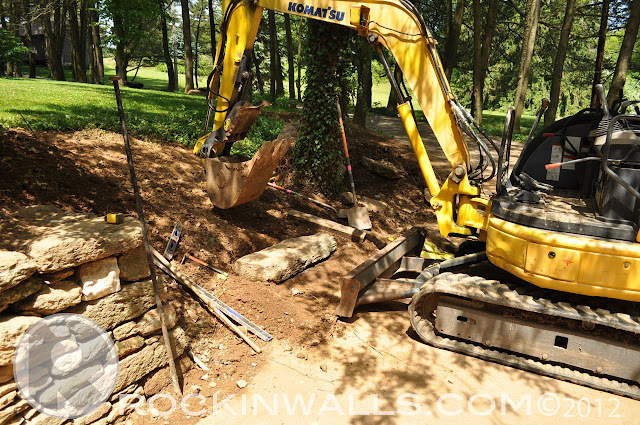 I had just got back my mini excavator with a all new customer ordered Geith thumb. Thats a story for another day. I was just happy to have it. I wanted the thumb after building the Warren Road (blog) wall with the floating steps. 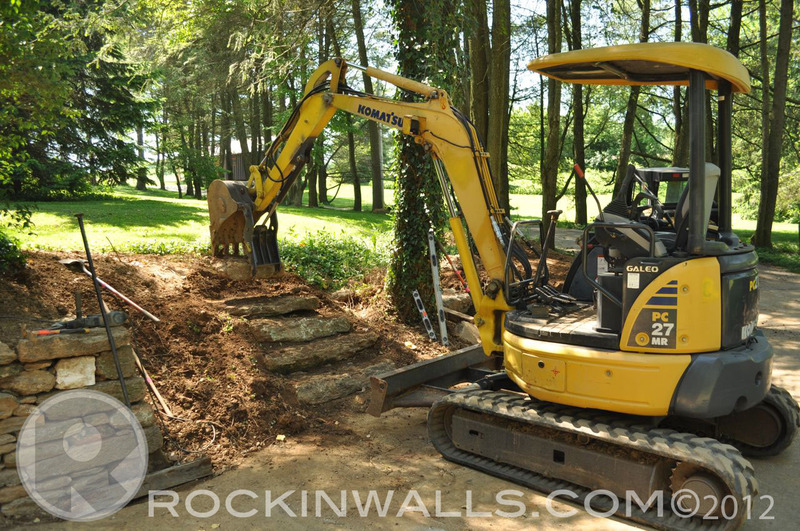 Placing those stones with my skid loader was not a easy task. So it only made sense since I work alone to have a machine that could do every thing I needed with out having to strap each stone then lift, place and move the strap out. Nope not with this set up. Find the stone - pick up the stone - Place the stone. If you have to make any adjustments just pick it back up again and do what needs to be done. Quick and to the point. Well worth the investment to me for this add on. My focus on the steps was simple keep them alined to the left to match the parallel line of the wall running back into the bank. The negative space between the steps and wall create a square box. Starting at the bottom I placed my largest stones shooting for a 7" step give or take with a 12" tread. After all this is natural stone. The first two set dead on level and those that fellowed best I could. Each stone step above sits on the one below. 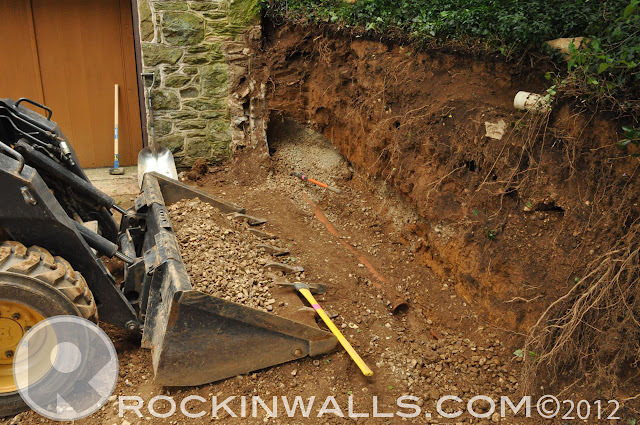 Earth was dug out as needed as I worked up the hill placing each step. Having the machine on site to handle this task and the stone made for a half day build. Notice the 2' and 4' level against the tree. I worked a long time to get that first stone in the right place. Just like building a wall if your foundation is on the money. Every thing else will just follow and fall into place. Notice in this picture how the end of the all matches the left side of the steps. The space in between would be consider the negative space if this was art. These small things can make or break a job. Now notice how well the energy flows with the right side and the tree. Moving way from the wall. I don't believe most contractors have any idea what negative space means. 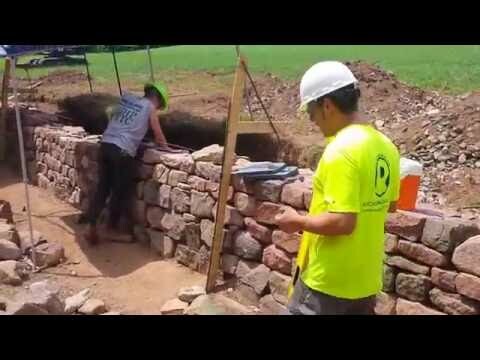 You can pay any one to build any thing and they'll even cash your check at the end of the job. The things I see I wonder how people sleep at night. The old corn cribs once called home. NOW all cleaned up and stone removed to on site location. This was my last day with rain non stop. 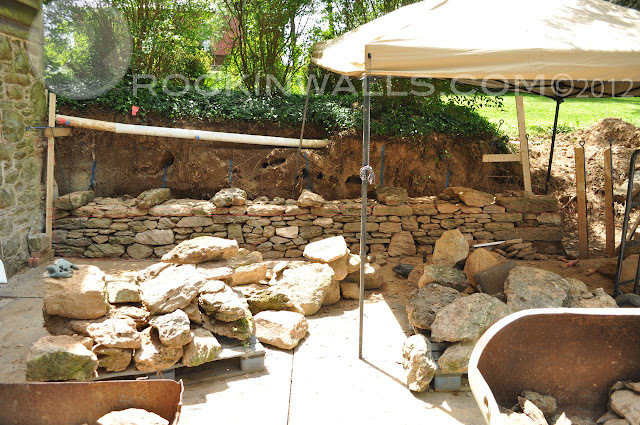 So excavating the site with removal of all the stone was a bit of a challenge. I used my skid loader and mini excavator to do the job. I couldn't have even had made a dent if I had to do all this my hand. I'd still be then I would have an excuse why it took so long to put this post up. Having the new thumb added to my mini excavator really helped lift up objects the skid loader would have had issues with. 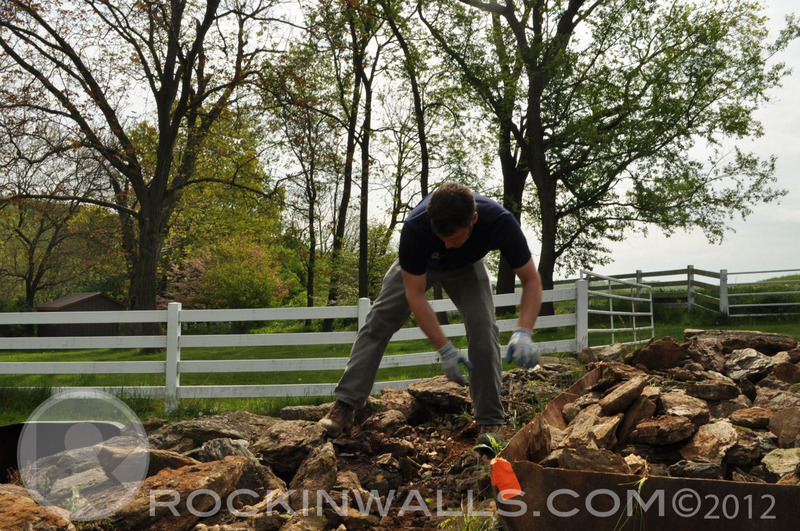 This tool sure came in handy at the time of clean up with large boulders. Thank you Geith for a job well done with the thumb. One of the biggest high lights for me was when I received a phone call from my master stone mason instructor just letting me know I did a great job with choices of sizes, colors, placement and that I was really progressing well with the craft. MADE MY WEEKEND. Not to often that happens. But it was a WOW moment for me one which made me proud of my continued success. Thank you to all of those who also feel my passion and see my dreams. With out you I couldn't tell these stories. PRICELESS!!!! If you made it throw this full blog entry you most likely need a bathroom break. Thank you for taking time to read this story. Great photo coverage and copy,very well done and great work! I really enjoyed this . Just found your blog . The detail you give and clear photography really makes it for me, lovely jubbly.